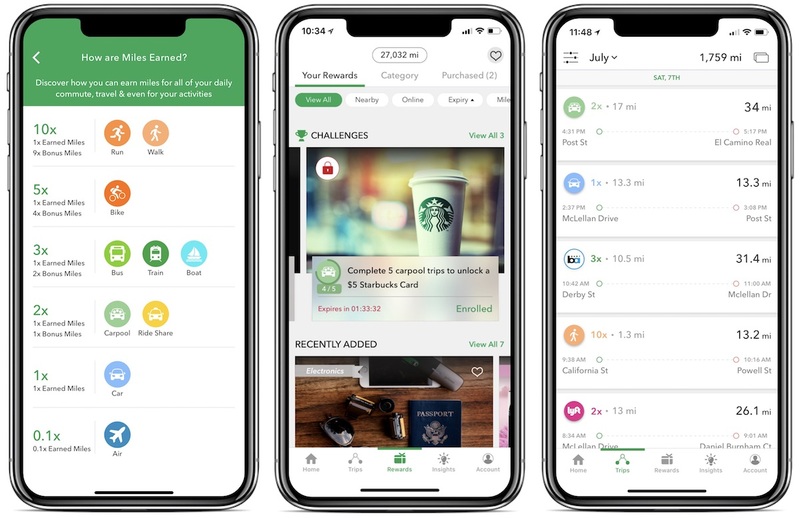 Startup "Miles" today launched a new iOS app [Direct Link] that grants its users exclusive rewards to use at places like Starbucks and Whole Foods every time they travel in a car, bus, on a bike, or on foot. The company aims for its app to be a ground transportation alternative to frequent flier miles, allowing users to earn discounts over time for travel that they likely perform more frequently than flying on an airplane (via The Verge). The caveat is that for the full experience, the Miles app requires you to give it constant access to your location, so it can keep up with automatically tracking your movement and converting its "miles" currency into deals and offers. You can opt to choose "only while using the app," but you'll then need to remember to keep Miles open every time you travel in order to gain rewards. Under Miles' rewards, you'll earn more miles for transportation that is more environmentally friendly: one real-world mile of walking/running grants you 10 reward miles, one mile of biking is worth five reward miles, a mile in a ride share vehicle is worth two, and a mile in a car is equivalent to one reward mile. At launch, you'll be able to trade these reward miles in for deals like $5 gift cards to Starbucks, Amazon, and Target, $42 off a first order from Hello Fresh, a complimentary rental on Audi's Silvercar service, and more. Other launch partners include Whole Foods, Canon, Bath & Body Works, and Cole Haan. When you trade in miles for rewards, some deals grant you with a barcode to scan at the physical checkout location (Starbucks), while others provide you with discount codes. In terms of its tech, Miles works in the iPhone's background to automatically log each trip a user takes from point A to point B. The company says that the app "consumes almost no power" when stationary, and will only "minimally increase battery consumption" when in transit. The app detects drives in a vehicle with special formulas that don't rely solely on GPS for location data, helping to reduce battery consumption. The app remembers your trips and logs them so you can revisit them later (including time of day, starting location, ending location, and distance) and fix any mistakes it might have made, like incorrectly logging a vehicle trip for a ride share. Additionally, there's a section of the app that The Verge describes as a "Venmo-style feed," showing how other users are earning and redeeming their miles. In an attempt to get ahead of users worrying about their location data being constantly tracked and stored by a third party, Miles CEO Jigar Shah says that neither the company nor its partners get access to specific location information. Instead, user data that is gathered is more ambiguous, but the app still knows when users travel, how they travel, and what deals they clip -- which is then fed into a "predictive marketing AI platform" to match them with other appropriate deals. To better explain how this works, Shah says, imagine there are 50,000 Miles users. 10,000 of those might be within 0.3 miles of a Starbucks. Out of those users, Miles can figure out which ones are most likely to buy a coffee within the next hour based on the history of where and when those people have stopped at coffee shops in the past. From there, Miles can also tell which users are likely to go to Starbucks, which will go somewhere else, and which customers aren’t too picky. The CEO promises that this "anonymously" aggregated information is secure and "nothing of users' data leaves the system." Still, as The Verge points out, the app will essentially be a middleman between businesses and customers, holding the latter's personal data in its hands, which is believed to have been what brought big brands to support Miles at launch in the first place. Despite promises of personal data privacy and security, Miles is launching in a time when online privacy is at the forefront of many users' awareness when signing up for a new service, or deciding to leave an old one. In the spring, the Facebook/Cambridge Analytica scandal broke, wherein more than 87 million Facebook users had their personal data gathered and used to reportedly influence their votes during the 2016 presidential election. Another app that heavily relies on user location data also faced a scandal in the spring, with MoviePass coming under fire for CEO Mitch Lowe pointing out that it watches "how you drive from home to the movies" and how the company watches "where you go afterwards." Lowe eventually admitted he was "completely inaccurate" and that the app "has never tracked" users in the background, with the developers removing an "unused app location capability" shortly after the story was shared online. Just last week, privacy researchers began pointing out that Venmo's publicly viewable feed of money exchanges (which has been around since the app launched), does not sit well in today's privacy-concerned climate. Now, more people have begun questioning why Venmo chose to have the feed's settings default to public sharing, likely resulting in many users who may not know their payment information is available for others to see. There a bunch of apps that do this sorta thing. None of them have ever been worth it. Why/how is this one different? Cool, I got a 2,000 mile sign up bonus and can immediately redeem a $5 Starbucks gift card. I wonder how long it will be until a company is just honest and says "Install our app, it has no features but we will track you and at the end of every month you get a $10 iTunes voucher"
A new way to tax the idiots, I mean poor. Are you calling poor people idiots? I'm confused. Has this been pulled? I wanted to check the App Store reviews to see if the issue regarding duplicate giftcards was resolved and it never loads. I tried the link in the article as well, no dice. Download it, sign up with a burner email, grant it location only while using the app, then as soon as you redeem the $5 gift card log out of the app and delete it from your device. Easy stuff and got a Starbucks gift card instantly. Next thing you know, advertisers will be posting billboards along certain routes people travel and making coupons available in newspapers, magazines, and online, and credit cards will be able to track your location and shopping habits by knowing where you use their card. That’s just simply crazy if those things happen! Like how you managed to get a dig in at ios and Ive. Well done.